Fractional laser technology has revolutionized skin rejuvenation approaches. It is considered the most important discovery of the decade in anti-ageing treatments. 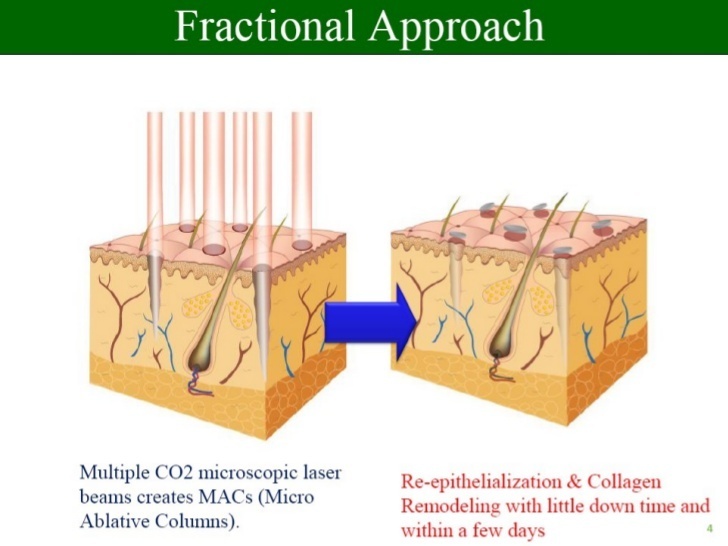 Fractional CO2 laser has evolved from the classic CO2 Laser, which for many years was used as a powerful interventional tool for laser skin resurfacing. The new fractional technology maintains all the advantages of the traditional ablative CO2 laser, with much fewer adverse effects and a dramatically shorter downtime. Fractional CO2 laser exerts its effect by creating tiny dots on the surface of the skin. These dots correspond to small holes (micro ablative columns – MACs) penetrating through the skin layers from the superficial keratin to deep dermis. Thus, microscopic columns of treated tissue are surrounded by intervening areas of undertreated skin. A prompt and powerful healing response is generated. leading to rapid re-epithelization. In the same time, old elastin and collagen fibers are damaged by laser energy and skin cells are triggered to produce new connective tissue fibers. Therefore the healing process at the surface of the skin is completed in a few days, while underneath new collagen is formed for the following 3-6 months. The result is a significantly more younger-looking and tight skin. Fractional Laser treatments can be applied on face skin and off-face, as well (neck, chest, abdomen, etc). Our practice boasts one of the most advanced and versatile Fractional CO2 laser systems, with multiple parameters that can be adjusted in order to apply the perfect settings required for each individual treatment. Treatment is usually well tolerated. The treated area of the skin is red for the first 24 hours. Any irritation usually subsides in less than one week on the face and in about two weeks on other areas of the body. The improvement is usually perceived immediately after the healing of the epidermis and continues to get better for the next months. Treatment with Fractional CO2 laser is by far the most effective therapeutic approach, that can deliver such a global rejuvenating effect on the skin, with just one annual treatment session.